What do you see? DUMMY ♠ 4 3 DECLARER ♠ A K Q 2 If your answer is 'Three top spade winners,' your vision can be improved! You should see 'Three top spade winners and squeeze possibilities using the ♠2 as a threat card.' Just this one rather ordinary suit should start you dreaming about squeezes. In this book, learning to recognize and appreciate threat cards plays a central role as you begin to understand how squeeze play operates. It won't be long before you can look at a layout like this one and begin to imagine how the East-West cards will need to lie in order for your squeeze to be successful. Very soon, you will get to the point where simple squeezes are a part of your regular bridge arsenal. The first edition of this book was named Book of the Year in 2006 by the American Bridge Teachers Association. Rules are made to be broken, and bridge is no exception. The the first of a planned four-book series on cardplay, this book deals with situations where the player who is on lead — defender or declarer, at the start of the deal or in the middle — needs to do something that involves ostensibly 'breaking the rules'. Not, obviously, the rules of bridge itself, but the well-tried adages that every player is taught — the rules of thumb that work in a lot of cases. Knowing when to break those rules is one of the marks of an expert player. One of the most popular and amusing bridge books in the history of bridge is Victor Mollo’s Bridge in the Menagerie. The reader experiences exciting bridge hands while on a journey marked with many funny stories and characters. If you haven't heard of the Hideous Hog, the Rueful Rabbit, Oscar the Owl, and the rest of the clan, then Bridge in the Menagerie is a must read. The suspense builds as they face trials and tribulations and intriguing bridge hands. The new and improved and now fully illustrated Bridge in the Menagerie by cartoonist Bill Buttle and Victor Mollo is a top ten best selling bridge book due to its high praise and reader recommendations. 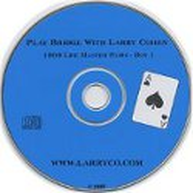 This bridge book was written so any bridge player can enjoy reading it over and over. 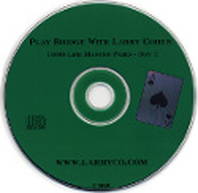 Although it is not meant to be instructional, it does offer the reader some insights on how other types of bridge players think and act. The very fortuitous Rabbit, the Bird who makes sure every rule is followed, the point counting Walrus, and the Hog who hates to be dummy are a few examples of why the characterization matches different 'types' of bridge players. This book was first published in 1959, and quickly became one of the classics of the game. Generations of bridge players have learned the fundamentals of squeeze play from Love. The original version has been out of print for some time, however, and it is now being republished in its first revision in 50 years. In its new modernized form, the concepts and terminology are much more accessible, and the book includes a number of squeeze concepts that have been discovered since the first publication. Don't forget to add the Bridge Squeezes Complete - Practice Hands free download to your shopping cart. Defenders invariably base their strategy on declarer's bidding. Yet so often declarers fail to return the compliment: they flail away without a thought of what the defenders have or have not done. Just one bid from an opponent may tip off declarer to the winning play - perhaps warning of a bad break or that a finesse is doomed. When the defenders have made several bids the declarer may be able to make spectacular double-dummy plays. The problems in this book all contains situations where an astute declarer can listen to the bidding, or lack of it, and derive information critical to the success of his contract. This book was originally published in 1990, and in this new edition is substantially revised and expanded. Did you ever notice how the bridge experts always seem to know where every card is? How their finesses always seem to succeed? How their guesses are nearly always perfect? This book won't teach you to play quite that well, but it will introduce you to some very simple techniques that the experts use on play and defense. As declarer or defender, counting the hand is the one thing that will help you the most. But how do you keep track of all those cards? This book will show you how — explaining the tricks of the trade, and helping anyone who can count to thirteen to become a much better player. Full of practical examples of how to apply the information you get from counting, this book is sure to improve your game. We have all seen bridge experts make plays that are elegant and simple, yet brilliant - with an instinct and insight apparently out of the reach of the everyday player. But they don't have to be. Study the hands in this book, all of which are taken from actual club and tournament play, and you'll see how the logic of each situation leads to a play that is 'easier done than said'. Then apply these ideas to your own game. Amaze your partners. Mystify your opponents. Play better bridge. Kantar's two-book series on Bridge Defense ( Modern Bridge Defense and Advanced Bridge Defense) won an ABTA Book of the Year Award in 1999. This new book addresses a more popular topic, using a similar approach. 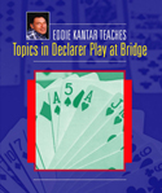 While not a comprehensive treatment of declarer play at bridge, this book deals with specific topics exhaustively, and will be invaluable to the improving player: finesses (when and how to take them, and equally importantly, when to avoid taking them), endplays, eliminations, issues with entries, suit establishment, and counting. Designed to be used by bridge teachers, or by students learning on their own, this book like its predecessors contains a host of features that help the student to grasp the material: clearly laid-out concepts, margin notes, practice hands, chapter-end quizzes, key-point summaries at regular intervals, and an index. Kantar's various beginner books have sold hundreds of thousands of copies, not least because of his unique writing style and the humor that he introduces into the learning process. For most intermediate bridge players, declarer play is both fascinating and challenging, but too often they are left after a hand is over with the sinking feeling that they could have done better. In this book, acclaimed British author Danny Roth takes his readers through the most common causes of errors on play: mishandling communications, making errors involving trumps, failing to take advantage of all possible chances, and many more. He explains how to recognize the danger signals, and how to avoid the pitfalls. The situations he describes are encountered every day; careful study of the examples in this book will make the reader a better card player, and improved scores will certainly follow. The late Terence Reese, perhaps the greatest bridge writer of all time, introduced the over-the-shoulder style of bridge writing in his classic Play These Hands with Me. In this wry homage to the master, Horton leads the reader through a plausibly logical line of play on each instructive deal, but one that ends in failure. In each post-mortem, the 'expert' realizes how he could have improved on his play, and (usually) have made his contract. The deals are all from top-class events, which prove to be a remarkably fertile source of such material. A book filled with subtle humor and great bridge. In 1985, Patrick Jourdain was commissioned by Britain's TV Channel 4 to provide bridge problems as part of its Teletext service. The problems caught the eye of the editor of BRIDGE Magazine, and eventually formed the basis for the popular ‘Problem Corner’ feature, which began in 1990 and still appears in the magazine every month. It is from these same problems that the contents of this book have been selected. A combination of real-life deals and constructed themes, they will provide a stimulating challenge to any solver. How good an analyst are you? HAND 2 - ACHILLES HEEL North ♠ A 9 8 5 ♥ Q J 5 3 ♦ Q J 10 ♣ K 4 West East ♠ K 10 7 2 ♠ Q 3 ♥ 8 7 2 ♥ K 10 6 4 ♦ A 8 ♦ K 6 5 2 ♣ 9 6 5 2 ♣ 10 7 3 South ♠ J 6 4 ♥ A 9 ♦ 9 7 4 3 ♣ A Q J 8 West North East South ? ? ? 1♣ Pass 1♥ Pass 1NT Pass 2♦* Pass 2NT Pass 3NT All Pass ? *Checkback asking for 3♥/4♠ Contract: 3NT Opening Lead: ♠2 Going up with dummy's ace of spades will not work because the resulting blockage will be merely temporary. East can win the first diamond and cash the spade queen. The defenders will score three spades and two diamonds. Playing low at Trick 1 seems more obvious, and the queen wins. If East returns a spade, the contract makes. North's nine will take care of the fourth round of spades and declarer can take the winning heart finesse after setting up the diamonds. Is the contract always cold, or can the right switch at Trick 3 kill it? See page 86 for the second part of the answer. This book was originally published in 1985, and in this new edition is substantially revised and expanded. 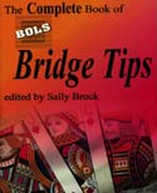 It is a collection of bridge problems designed to teach players how to think along the right lines at the bridge table. Anyone who absorbs even a fraction of the ideas presented here will himself be making contracts that might have been defeated, and defeating contracts that might have been made. Take All Your Chances at Bridge was published in 2009 and has already been reprinted twice. It won the American Bridge Teachers 2010 Book of the Year Award for best intermediate-level book. In this sequel, Kantar presents another collection of play problems for advancing players. Again, the theme is not just finding a good line of play: the trick is to combine as many possible lines as possible to optimize your chances of making the contract. Full of Kantar's inimitable humor and extra tips, as well as lots of good bridge, this one is another sure winner. Become a better declarer - and Eddie Kantar promises it will be relatively painless! The problems in this book are not for experts — they are, however, for anyone whose ambition is to become a better bridge player. The problems involve the everyday cardplay maneuvers you have to master if you are going to improve as a declarer. As you work through this book, you will encounter more than one example of each theme — endplay, avoidance play, etc. This is intentional — it is important to recognize these situations, and by the end of the book you will be able to do just that. You are making progress if you get a problem wrong the first time a theme appears, but spot it the next time it comes around. And if you have a friend who consistently goes down in cold contracts, you could not do him/her a better favor than to give them a copy of this book. The BOLS Bridge Tips competition started in 1974, and took place off and on for more than 20 years. During that time, virtually all the world's greatest writers and players contributed their ideas to the series. For the first time ever, the entire collection of BOLS Bridge Tips are gathered here in one volume, edited and organized for easy access by the average player. Included too are biographies and photographs of all the contributors. Not sure what to lead? Can't decide the right bid? Want to make more contracts? 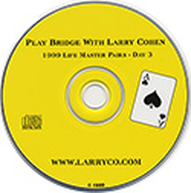 Get pointers from the all-time greatest names in bridge -- Reese, Rodwell, Zia, Flint, Goren, Hamman, Wolff, Schenken, Garozzo, Belladonna, Chagas and many more -- they're all represented. All the advice is here in a perfect potpourri for players of every standard. This book, originally published in France in 2005, is an amazing achievement. 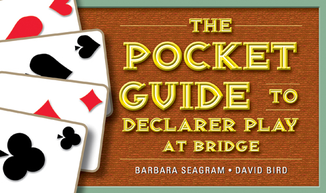 The author has for many years been collecting and cataloging bridge hands with the aim of describing every possible tactic and coup available to declarer and defenders during the play of a bridge deal. The result is a compendium of more than a thousand types of stratagem, organized by theme, and progressing from the simplest finesse to the most complex squeeze — every one accompanied by carefully explained examples. The major sections are: 1. Thinking techniques 2. Special plays, coups, and gambits 3. Techniques specific to trump contracts 4. Finesses 5. Technical aspects of squeezes 6. Notrump squeezes 7. Trump squeezes Whether you are a casual player or a top expert, this is a book that simply has to be part of your bridge library. Eric Rodwell is widely regarded as one of the absolute best bridge players in the world. In The Rodwell Files, Rodwell covers a wide-range of topics that get increasingly difficult as the book progresses. You can either buy the complete book, or purchase it in parts. Eric Rodwell is widely regarded as one of the absolute best bridge players in the world. In ths book, Rodwell covers a wide-range of topics that get increasingly difficult as the book progresses. You can either buy the complete book, or purchase it in parts. This volume covers Part 2, Advanced Cardplay Maneuvers.